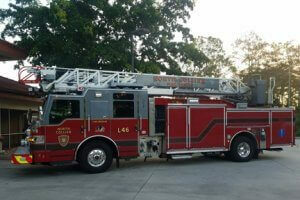 Ladder 48 is a 2006 Pierce Quantum 75′ Aerial. 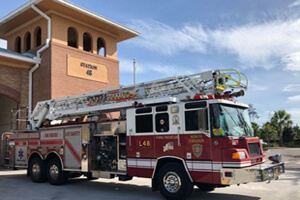 With 500 gallons of water, a 1,500 gallon per minute pump plus 20 gallons of foam, Advanced Life Support equipment, and special “truck company” tools, Ladder 48 is able to handle a variety of calls. Ladder 46 is a 2018 Pierce Velocity. 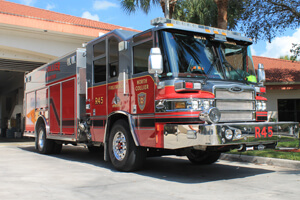 With 500 gallons of water, a 1,500 gallon per minute pump, Advanced Life Support equipment and special “truck company” tools, Ladder 46 is able to handle a variety of calls. 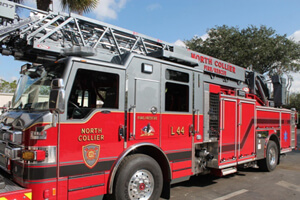 Ladder 46 serves the 1-75 north and south bound lanes and all the neighboring areas including The Community School of Naples and the community of Kensington Park. Ladder 44 is a 2017 Pierce Impel PUC 107′ Aerial. Ladder 44 carries 300 gallons of water with a 1,500 gallon per minute pump. Ladder 44 has the longest reach out of all the aerials in the District. Ladder 44 is equipped with special “truck company” equipment which allows it and the crew to respond to medical calls, vehicle accidents, structure fires and special operation type emergencies. 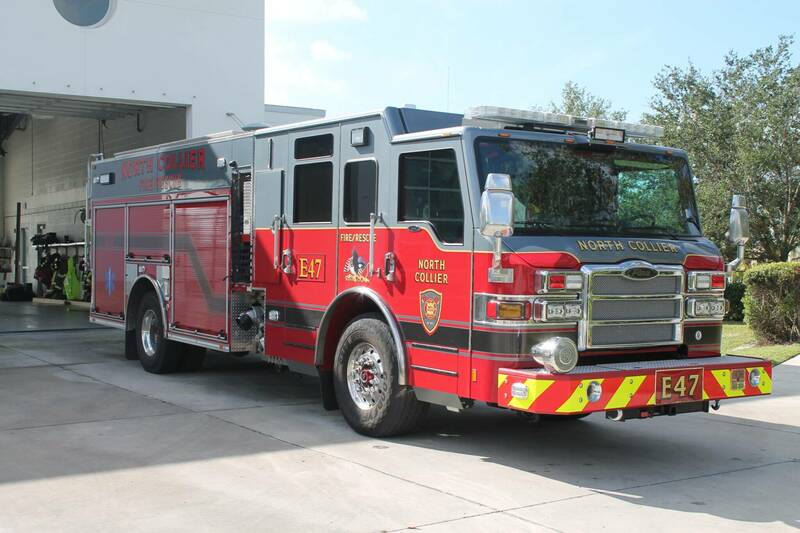 Engine 480 is a 2005 Pierce Contender with a 750 gallon water tank and a 1,250 gallon per minute pump. Engine 47 is a 2017 Pierce Impel PUC Pumper with a 750 gallon water tank, a 1,500 gallon per minute pump plus 50 gallons of foam tank. 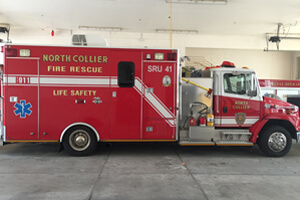 Equipped with state-of-the-art vehicle extrication tools as well as Advanced Life Support Equipment, Engine 47 responds to medical calls, fires, vehicle accidents and calls for public assistance in the southern part of the district. Engine 44 is a 2014 Pierce Impel PUC Pumper with a 500 gallon water tank, a 1,500 gallon per minute pump plus 30 gallons of foam tank. 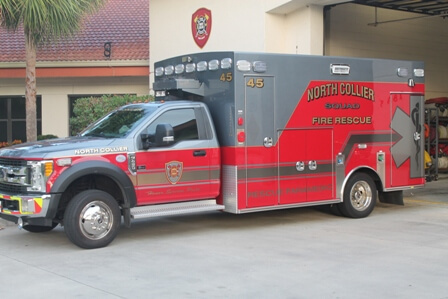 Equipped with state-of-the-art vehicle extrication tools as well as Advanced Life Support Equipment, Engine 44 responds medical calls, fires, vehicle accidents and calls for public assistance in the Pelican Bay area. 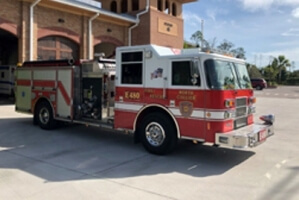 Engine 43 is a 2014 Pierce Impel PUC Pumper with a 500 gallon water tank, a 1,500 gallon per minute pump plus 30 gallons of foam. 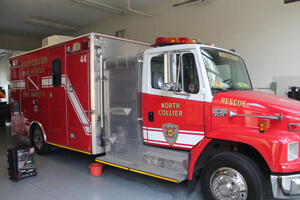 Equipped with state-of-the-art vehicle extrication tools as well as Advanced Life Support Equipment, Engine 43 responds to medical calls, fires, vehicle accidents and calls for public assistance in the northern most part of the district. 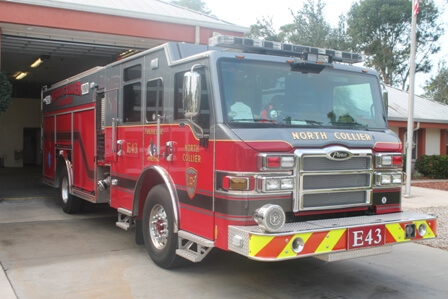 Engine 42 is a 2015 Pierce Impel PUC Pumper which carries 750 gallons of water. This vehicle is equipped with a 2,000 gallon per minute pump and has a 50 gallon fire foam tank. 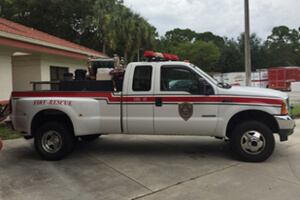 Engine 42 is designed carry Advanced Life Support equipment with access from outside of the truck, reducing injuries and tripping hazards from carrying the equipment up and down the steps. It is also equipped with state-of-the-art vehicle extrication tools for rescue calls on I-75 and roadways throughout the district. 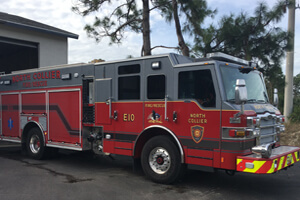 Engine 40 is a 2017 Pierce Impel Engine. 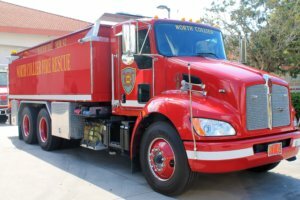 It’s equipped with a 1,500 gallon per minute pump, carries 750 gallons of water and 50 gallons of foam. 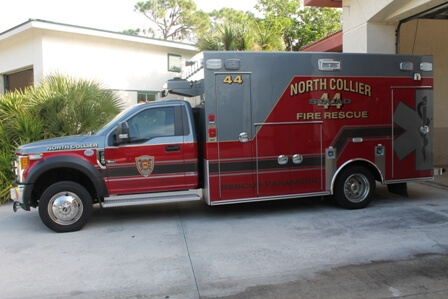 Equipped with state-of-the-art vehicle extrication tools as well as Advanced Life Support Equipment, Engine 40 responds to medical calls, fires, vehicle accidents and calls for public assistance in the Pine Ridge Road area. 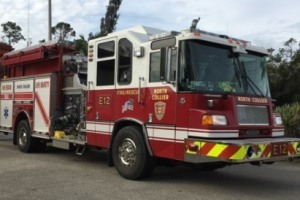 Engine 12 is a 2003 Pierce Quantum Engine that is outfitted with 750 gallons of water with a 1,250 gallon per minute pump and two 30 gallon foam tanks. Engine 12 is also equipped with Advanced Life Support. 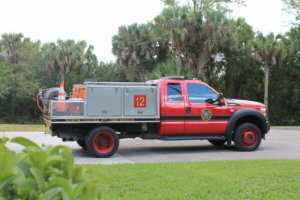 Engine 12 responds to medical calls, fires, vehicle accidents, and calls for public assistance in the Big Corkscrew Service Delivery Area and eastward to the Immokalee Fire District. Engine 10 is a 2017 Pierce Impel that carries 700 gallons of water with a 1,500 gallon per minute pump. The apparatus also carries 50 gallons of foam. Rescue 45 is a 2010 Pierce Quantum PUC and has a 1,500 gallon per minute pump and carries 550 gallons of water plus 30 gallons of foam. 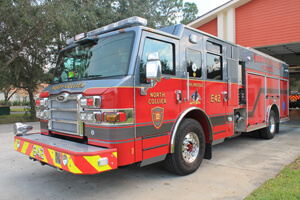 Recue 45 has been custom configured to serve as a first-run engine and heavy rescue. 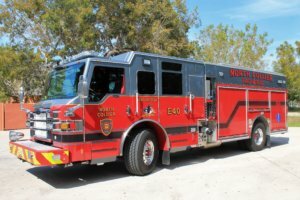 The vehicle also carries haz-mat monitoring equipment for first-line hazardous materials response capabilities as well as some trench rescue operations. 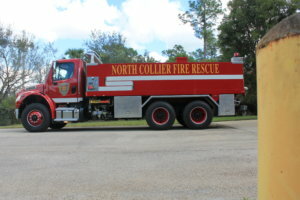 Water Tender 42 is a 2008 Kenworth/Pierce that carries 3,000 gallons of water with a 500 gallon per minute pump, Water Tender 42 responds to brush fires and structure fires. 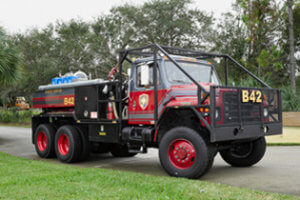 Water Tender 42 is a mobile water supply for units responding to minimal hydrant areas. 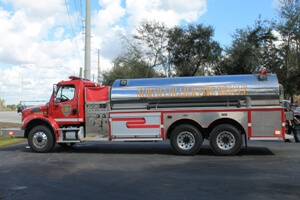 Water Tender 12 is a 2007 Freightliner/E-One that carries 3,000 gallons of water with a 1,000 gallon per minute pump. 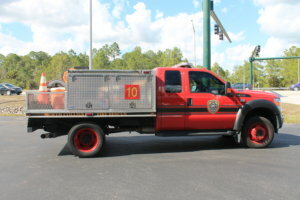 Water Tender 10 responds to brush fires and structure fires and serves as a mobile water supply for units when responding to minimal hydrant areas. Attack 12 is a 2013 Ford F-550 extended cab truck and chassis. 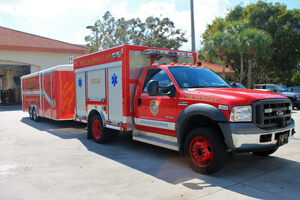 Equipped with a 250 gallon per minute pump, 300 gallons of water and Advanced Life Support equipment, Attack 10 provides a quick response for medical calls, fires, vehicle accidents and calls for public assistance. Attack 10 is a 2015 Ford F-550 extended cab, 4X4 truck and chassis. Equipped with a HPX75 pump, 300 gallons of water, and Advanced Life Support equipment, Attack 10 provides a quick response for medical calls, fires, vehicle accidents and calls for public assistance. 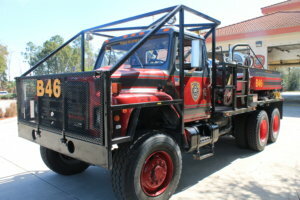 Brush 48 is built on a 1955 Rio 6×6 military chassis and carries 750 gallons of water with a 400 gallon per minute pump. 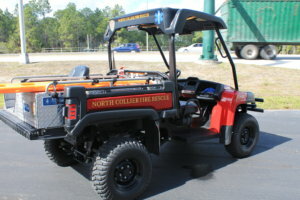 The apparatus is used for fighting brushfires and can travel through all types of rough terrain. 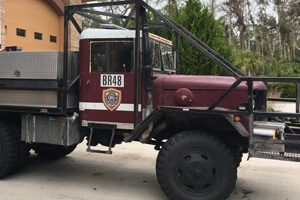 Brush 46 is a converted military International S1900 6 X 6 wheel drive equipped with a 1,000 gallon water tank and a 400 gallon per minute pump and a side mount turret. Brush 46 is able to fight both large and small brush fires. 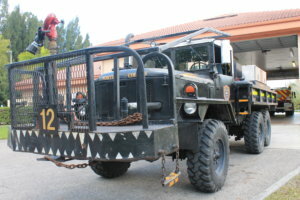 This vehicle is a Converted Military International S1900 6 X 6 All-Wheel Drive. It carries 750 gallons of water and has a 400 gallon per minute pump. It is also equipped with a fire foam system to expand the effectiveness of its water during brush fires. Brush 42’s sister truck is Brush 46. 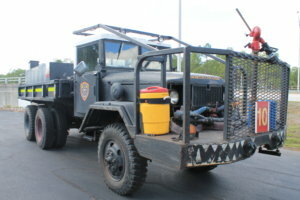 Brush 12 is known as The Beast Of The East, a “Deuce and a half” 6 X 6 retired military transport unit and is fitted with a 750 gallon water tank and a HPX75 pump. Brush 12 has front platform with a water turret as well as shovels, rakes, and hose reel. Brush 12 is able to fight both large and small brush fires.. Squad 46 is a 2017 Ford/Braun Ambulance. Sisters with Squad 45 and 44, Squad 46 is one of the fast response ALS vehicles. Equipped with Advanced Life Support equipment as well as firefighting equipment, Squad 46 responds to medical calls as well as structure fires. Squad 45 is a 2017 Ford/Braun Ambulance. Sisters with Squad 44 and 46, Squad 45 is one of the fast response ALS vehicles. Equipped with Advanced Life Support equipment as well as firefighting equipment, Squad 45 responds to medical calls as well as structure fires. 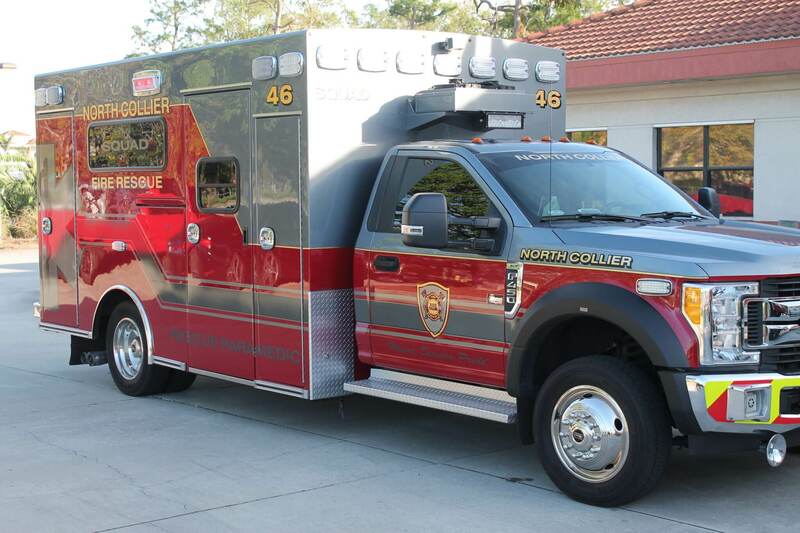 Squad 44 is a 2016 Ford/Braun Ambulance. Sisters with Squad 45 and 46, Squad 44 is one of the fast response ALS vehicles. Equipped with Advanced Life Support equipment as well as firefighting equipment, Squad 44 responds to medical calls as well as structure fires.. 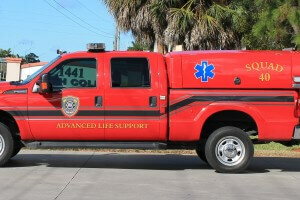 Squad 40 is a F350 4×4 and is one of the fast response ALS vehicles. Equipped with Advanced Life Support equipment as well as firefighting equipment, Squad 40 responds to medical calls as well as structure fires. 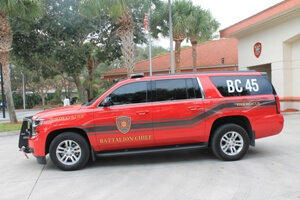 Battalion 45 is a 2016 Chevy Suburban outfitted with the latest in incident response and management equipment. 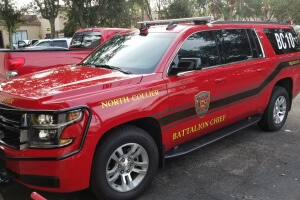 Battalion Chief 45 is the battalion chief for the North Battalion that includes Stations 43, 44, 45, and 48. Battalion 45 responds as the incident commander to significant calls such as structure fires, brush fires and vehicle accidents. 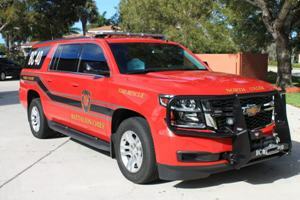 Battalion 40 is a 2016 Chevy Suburban outfitted with the latest in incident response and management equipment. Battalion Chief 45 is the battalion chief for the South Battalion that includes Stations 40, 46, and 47. Battalion 40 responds as the incident commander to significant calls such as structure fires, brush fires and vehicle accidents. Battalion 10 is a 2016 Chevy Suburban outfitted with the latest in incident response and management equipment. Battalion Chief 10 is the battalion chief for the East Battalion that includes Stations 10, 12 and 42. Battalion 10 responds as the incident commander to significant calls such as structure fires, brush fires and vehicle accidents. 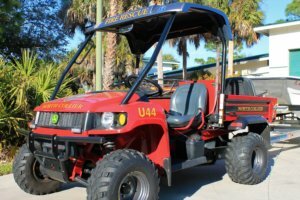 Utility 44 is a John Deer Gator and serves as the District’s beach utility vehicle. It also responds to hard-access calls including boardwalks and is used at community events including golf tournaments. Utility 10 is a 2017 Kawasaki Diesel 4×4. This 5 seat off-road vehicle is capable of going through areas Attack 10 may not be able to go. Utility 10 responds to any missing person calls as well as special events. 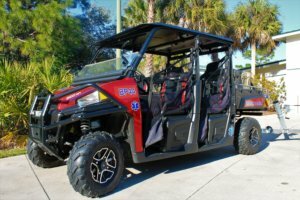 Beach Patrol 44 is a Polaris Ranger Crew and serves as the District’s beach response vehicle. It also responds to hard-access calls including boardwalks and is used at community events including golf tournaments. 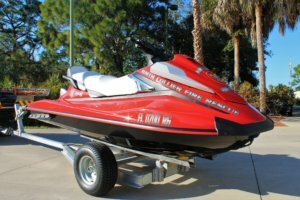 Beach Patrol 41 is a 2017 Yamaha Jet ski used for water rescue. 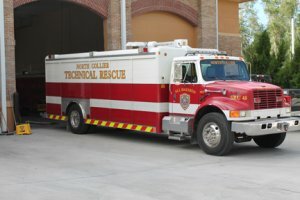 Special Response Unit 45 is a 1999 Ford F-350 4×4 and is used to tow various trailers containing HazMat gear and supplies. 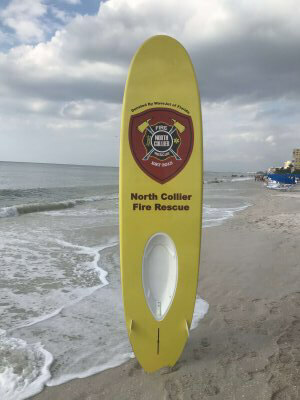 Donated to the District by Wavejet of Florida, this 11′ motorized paddleboard is propelled by a jet propulsion system that is clean, quiet, battery-powered miniature jet drive that is eco-friendly. It moves at 7mph with 20 lbs. of thrust with a continuous run time of 50-55 minutes. This apparatus is an integral part of beach/swimmer rescues. 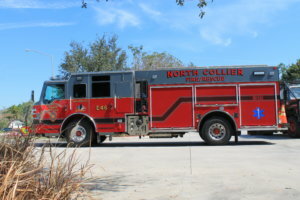 Special Response Unit 48 is a 1995 International 3ESV that carries equipment to handle technical rescues including trench collapse, confined space entry, high angle rescue and structure collapse. 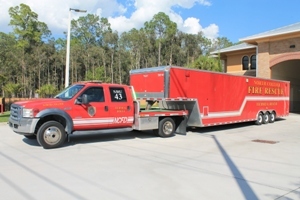 Special Response Unit 43 is a 2007 Ford F-550 with a 30 foot trailer that carries equipment to handle technical rescues including trench collapse, confined space entry, high angle rescue and structure collapse. Special Response Unit 42 is the primary unit for the District’s Dive Team, providing transport for their equipment as well as a location for rescue divers to suit-up. The vehicle carries dive gear for eight team embers at one time and is wet and dry suit equipped. 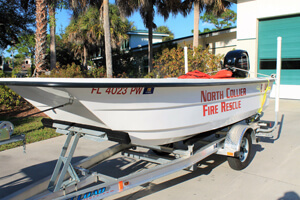 Boat 41 is a 36′ Fire Bt with a 750 gallon pump and is both Advanced Life Support and dive equipped. Boat 41 is docked at the District owned boat slip at Wiggins Pass. 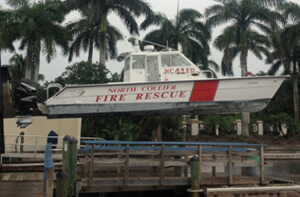 The District’s boat apparatus also includes a 17′ rescue boat, a 15′ rescue boat and a 19′ inflatable, swift-water boat. Boat 43 is a 1999 17′ Twin Vee. Special Response Unit 42 is a 1999 Freightliner FL 70 that is typically coupled with HM 41 heavy duty trailer. Special Response Unit 41 is a 1999 Freightliner and is also known as the “Science Vehicle” as it is equipped with a mobile lab. It also houses a communications system, an integral part of responding to hazardous materials emergencies. Owned by the Collier County Sheriff’s Office, the Bell UH-1H, more commonly known as a Vietnam-era Huey, was built in 1968. In 1971, it reported for its first tour of duty in Vietnam where it was shot and damaged just one month later. It returned to the U.S. for repairs and entered into service again for the FBI, the U.S. Border Patrol and finally with the U.S. Customs and Border Protection Air and Marine Operations. 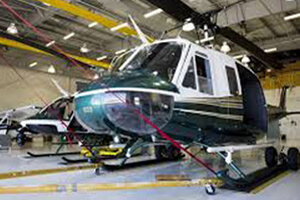 The Collier County Sheriff’s Office bought the surplus craft for $400,000 and spent an additional $350,000 to retrofit the craft and train deputies to fly it. The craft can safely carry eight to 10 people and up to 4,000 pounds.